How would you know that these little things called flowers could cost a lot of your time of indecision. With lots of options, especailly in Davao, it's difficult to choose. 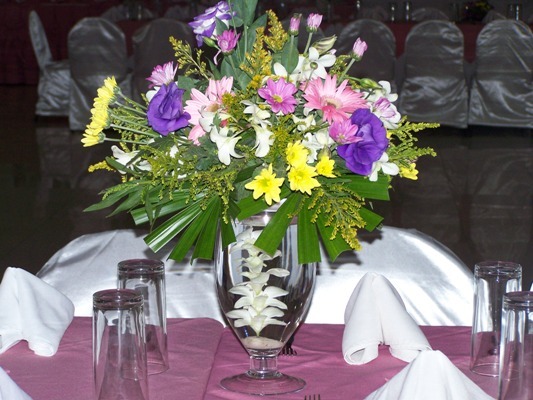 A florist can be your your best ally, but did you know that Linmarr can be too. After all, they just won the Gold Prize at the KADAYAWAN's Buffet Floral Centerpiece' (Professional Category) contest in 2008. Continue on and we'll help arm you with practical ideas and information no matter where you hold your wedding. "Naa napud si Tiya Maria sa iyang mga brilyanting ideyas" (Here's Tiya Maria with her brilliant ideas). Most people see colors before they notice the types of flowers and their arrangement, so picking shades first is paramount. A good place to start is to first assemble your palette on your own by following a few guidelines. 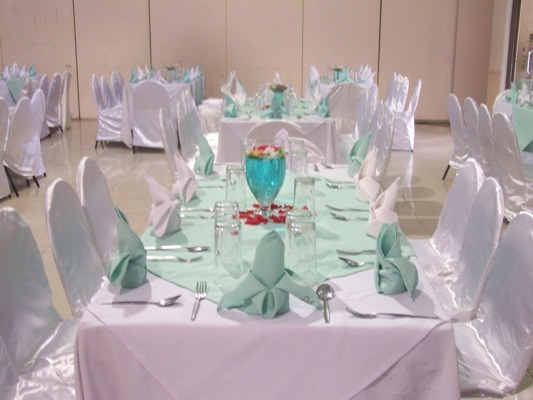 Decide which colors in your ceremony and reception locations you want to enhance or play down. If the walls are yellow, yellow blooms may fade into the background, causing the green stems to stand out. Consider the lighting you have to work with. 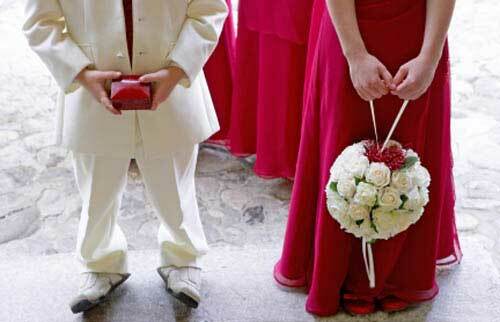 At a day wedding, sunlight will flood the space, so pale colors may get washed out. 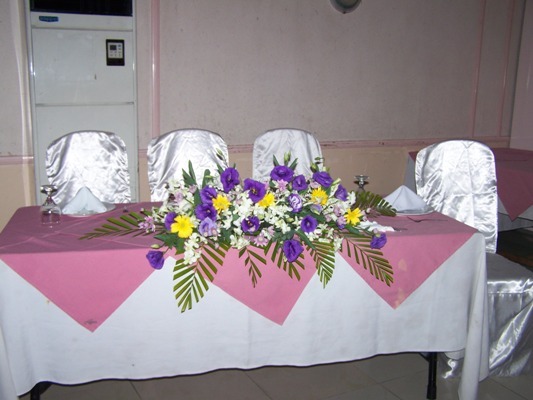 At a dimly lit evening wedding, purple may appear gray in photographs. Try using warm colors(red, orange, yellow) in low-light setttings - warm colors reflect light better, while cool colors (blue, purple, green) recede into darkness. Pick three colors to start; you can add more later. Looking to create drama? Opt for contrasting hues (like red and green). Sequential colors (those next to one another in the rainbow) evoke a subtle sophistication. For inspiration, visit www.colourlovers.com or log on to www.colorschemers.com. What's the style of your wedding? Certain colors and blooms evoke different levels of formality, partly depending on how they are arranged. 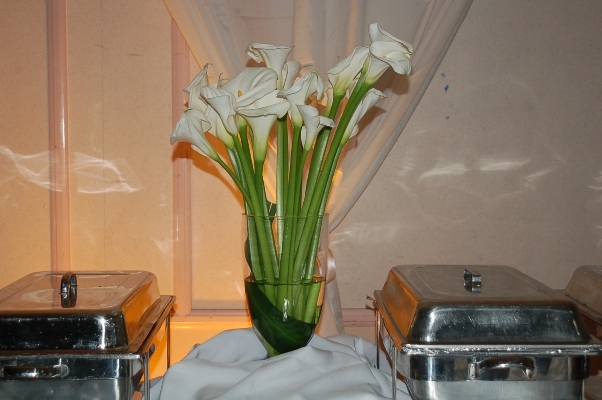 If you want a casual, carefree feel, a white orchid will look like an over dressed dinner guest. On the other end of the spectrum, a formal affair requires something more elegant than an earthy bouganvilla. Unfortunately, most flowers don't fall easily into one category or another. But generally speaking, bright colors and dynamic shapes have an informal feel, white muted monochromatic or single-variety collections appear more formal. Consider the pattern that the vases would make on our table. Two Ideas: 1.) 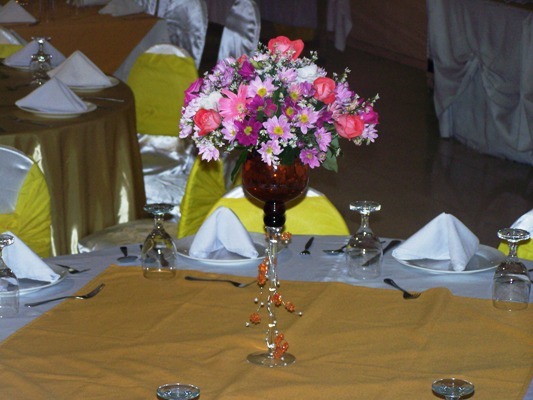 a row of identical vases on a long table and 2.) a group of vases in various shapes and sizes in the middle of a round table. Tall and narrow: Ideal for torch-shaped arrangements. Short and stout: Perfect for low half-globe of flowers, like roses and dahlias. Tall and wide: Suits long stemmed flowers. 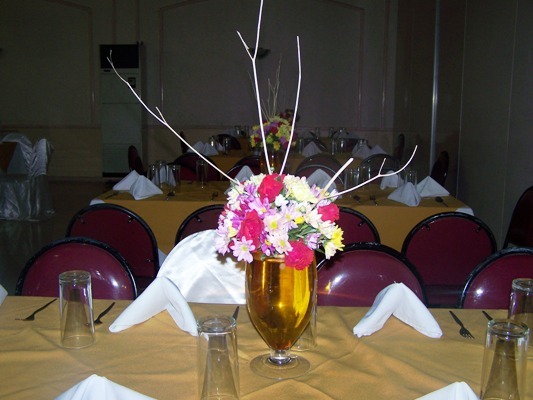 Bud Vases: Fit for top-heavy flowers, like hydrangeas that need stem support. 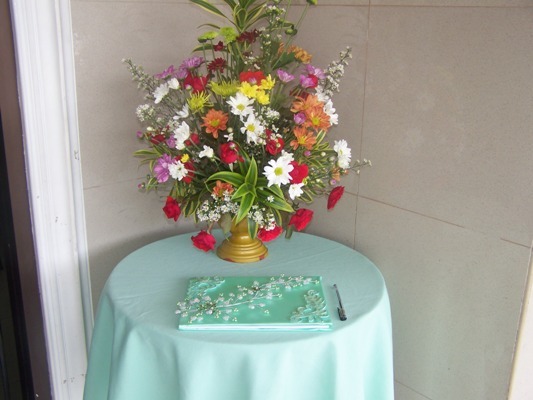 Urn: Allows you to make a round bouquet, even with top-heavy flowers. When is the best time to have flowers delivered? At the last possible moment, even if the building is air-conditioned, to prevent wilting. Your florist will determine the delivery time, taking into account the time of year, the temperature, and the sun's brightness. Florists should use climate-controlled vehicles, so the blooms arrive fresh. In Davao, such vehicles are not readily available, so you should talk to your florist regarding delivery schedule and precautions to take. The big challenge is preserving flowers during photo shoots before the wedding. 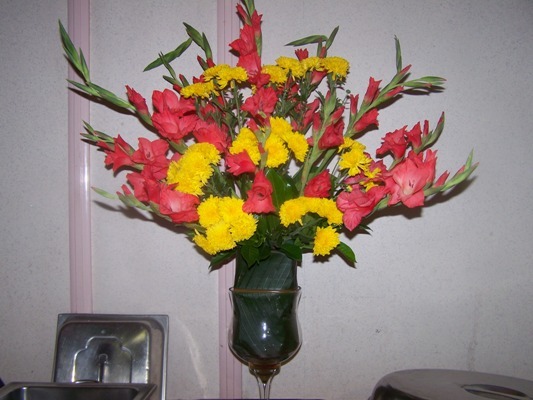 Consider paying a florist to be on-hand to add replacement flowers as needed. And ask your florist for preservation strategies, such as putting the bouquets in water-filled vases between photos instead of setting them on the table. 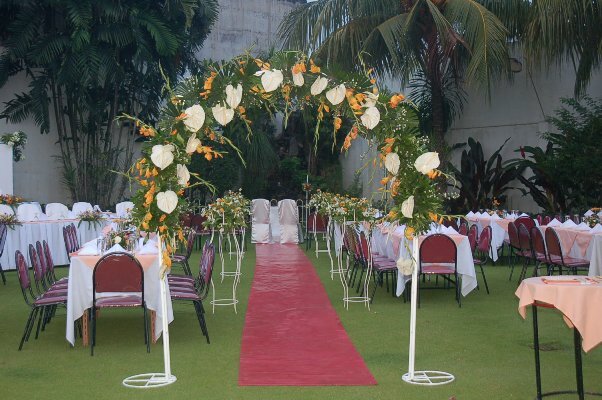 For your information, if you have taken a Wedding Package with Linmarr, most of the flower arrangements are included and are done on-sight and you need not worry about anything anymore. What should I do to keep flowers looking fresh? Certain large-petal blooms, such as gumamela, are likely to bruise, so they should be kept away from areas that see a lot of action, like the groom's lapel. Some white colored flowers don't work well in the hair because oil gets on the petals causing them to brown (Instead, try orchids, which is surprisingly sturdy). Some wildflowers don't have a long cut life and often will wilt when out of flower. A post harvest "hydration solution" will help stems hold fluid and prevent them from bending. Who gets corsages or boutonnieres? Those who are standing. The groom, the groomsmen, and the ring bearer typically wear boutonnieres that will complement the bridal bouquet in the flower type or color. Readers and ushers are also distinquished with corsages or boutonnieres so that they are easily identifiable to guests. Those who have stood by you and the groom. For mothers, fathers, grandmothers, grandfathers, and siblings - or any other special relatives-who are not a part of the ceremony, flowers are a nice gesture. Keep in mind that they don't have to match the bridal bouquet. Must I toss the bouquet? No. Bouquet tossing, "panahon pa ni Lim-ah-Hong" (an age-old tradition) that says the catcher of the bouquet will be the next to marry, is becoming less and less common. Your single friends may feel silly lining up in front of couples, so if you break with tradition, there will probably be a few protestors. Instead, you could also make a bouquet of lottery tickets, or restaurant gift cerificate and lob it to the coed crowd of guests as a real good-luck token. Should we have our guests toss rose petals as we leave the reception? If you wish. The delicate way rose petals float to the ground makes them popular, not to mention the fact that they will biodegrade. One good idea is to freeze-dry the petals to retain their color and texture longer than fresh ones. Sparklers. Have the bridesmaids distribute them to guests so you can exit under a canopy of lights. Are there any options besides carrying a bouquet of flowers? A prayer book, perhaps one that has been passed on to you by your grandmother for such an occasion. A bunch of fragrant herbs is a fun choice for a gourmet couple. A blooming lavander: Have the flower girl scatter lavander buds ahead of you so guests too, can enjoy the scent. Candles, parasols, or folding fans. 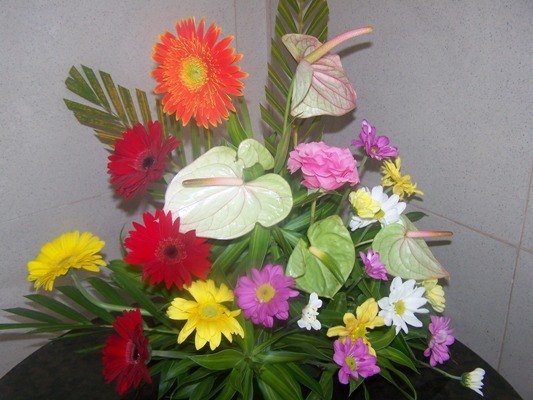 How can Linmarr help in our flower arrangement? 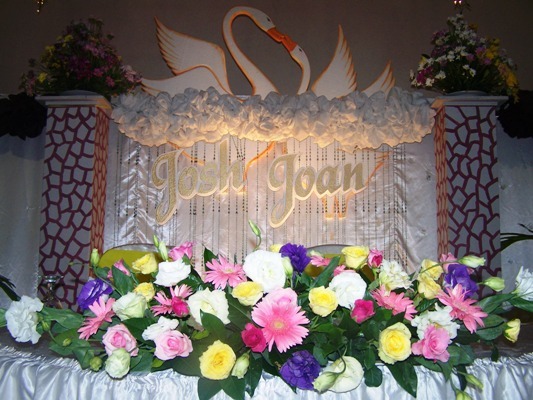 They have an inhouse team that can do the backdrop and floral arrangement. It would be part of the wedding package that they offer. For the backdrop, the client has a choice for the text, font, and color. 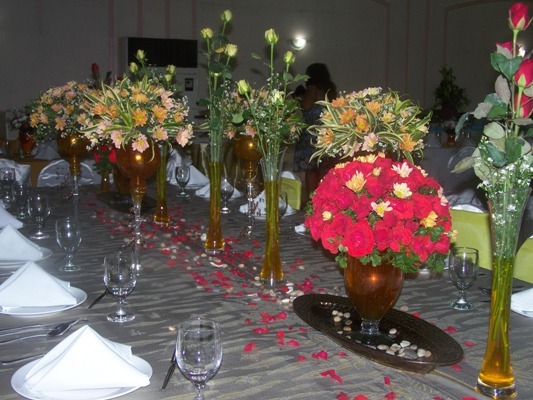 For the floral arrangement, they do suggest the flowers in season that are available during the months of their wedding. 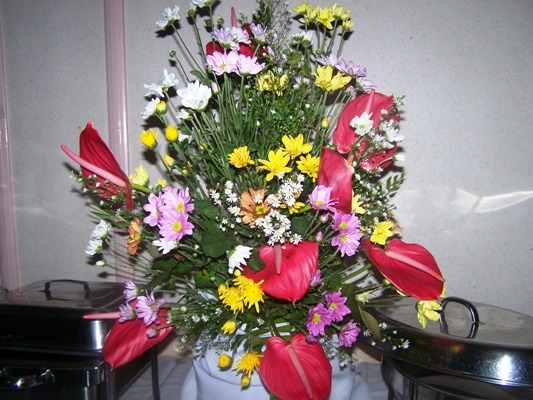 Usually they provide the flowers and they decide on the arrangement. 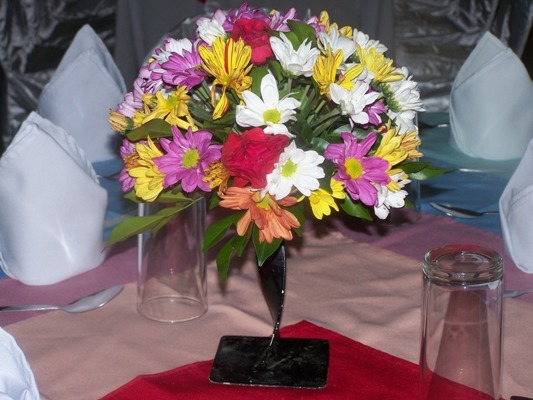 But, if a client has a preference for the choice of flowers and the type of arrangement then they do charge an extra fee. This can be discussed with Linmarr to determine the exact amount of the fee. Please inquire by using the Contact Us form or just give them a phone call.